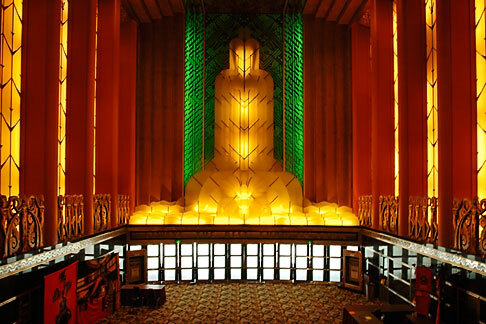 The Paramount is one of two great Art Deco movie theaters remaining in America – the other is Radio City Music Hall. 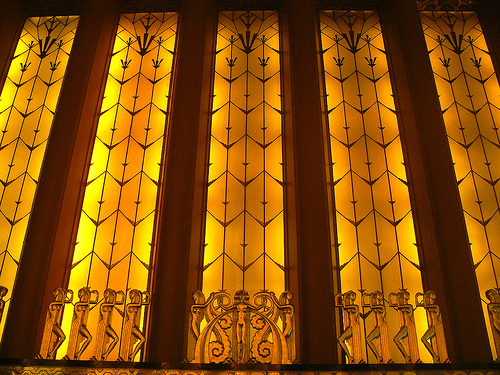 Designed by celebrated San Francisco architect Timothy L. Pflueger (who also designed that city's Castro Theatre), its construction was begun by Publix Theatres, the exhibition arm of Paramount Pictures, during the Great Depression. Financial problems forced the sale of the building-under-construction to Fox-West Coast Theatres who completed the project and opened the Paramount in December 1931. Though Hollywood studios owned all the major theaters and controlled film distribution completely during the “The Golden Age,” the Depression would bring change and the Paramount would be the last studio-owned movie house built in the U.S. 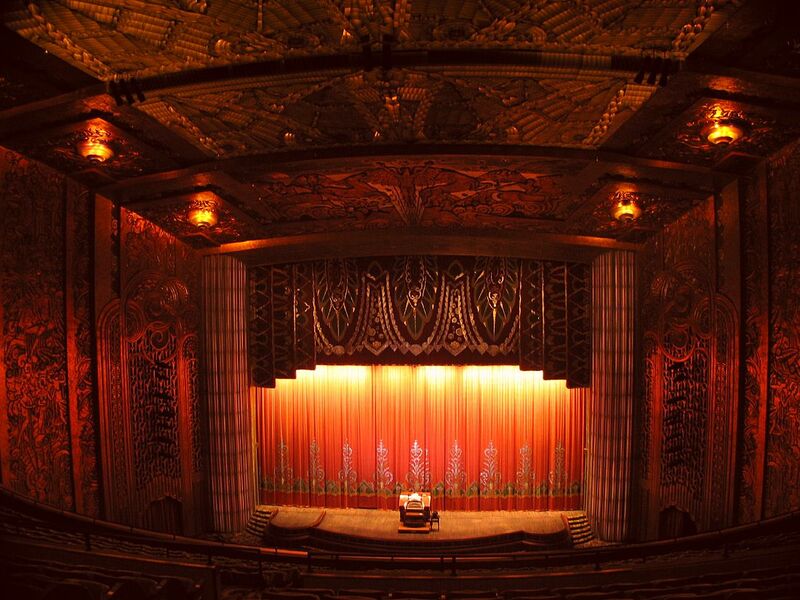 In its day, with 3,000+ seats, the Paramount boasted the largest auditorium seating on the West Coast. As with so many of America’s once-grand movie palaces, the Paramount suffered a long period of decline following its glory years - but it was more fortunate than most. In 1972 it was purchased by the Oakland Symphony and given a thorough and authentic restoration that was completed in 1973. 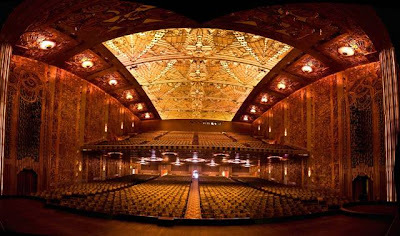 In 1975 the City of Oakland assumed ownership and the theater became a California Registered Historic Landmark in 1976 and a National Historic Landmark in 1977. 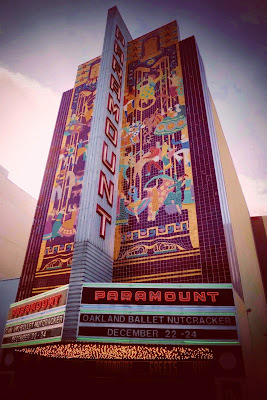 Today the Paramount is home to the Oakland East Bay Symphony (formerly the Oakland Symphony) and the Oakland Ballet. The theater is a premiere year-round performing arts facility that hosts concerts of all musical genres (from B.B. 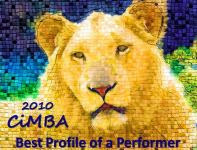 King to Leonard Cohen), variety shows, stage productions and movies. Tours of the Paramount, located in the trendy Uptown district, are scheduled on the first and third Sundays of every month, excluding holidays and holiday weekends. Ticket price: $5. Click here for more on what’s happening at Oakland's Paramount Theatre. Click here for more photos. What a beautiful theater. I wish I was there to see "Vertigo." I also want to tout another historic theater if you ever make it out to Chicago, and that's the Paramount Theatre in Aurora. 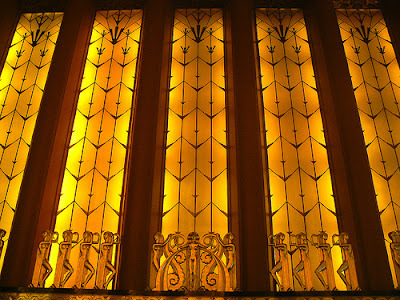 Opened on Sept. 3, 1931, it definitely captures the art deco feel of the time. 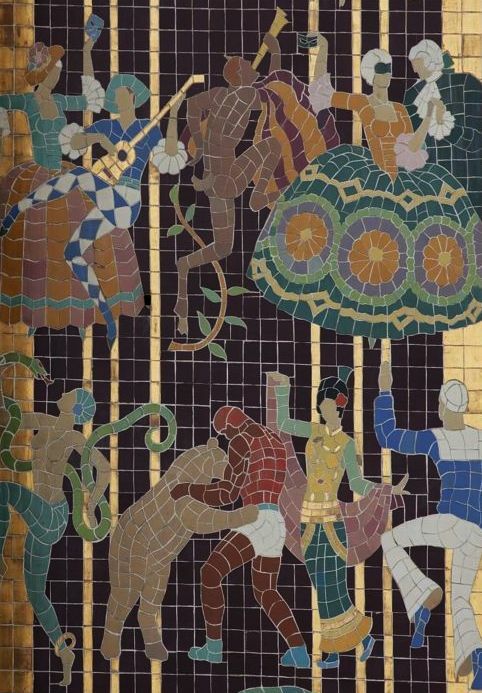 The theater was completely refurbished in the late 1970s and with 1,800 seats -- smaller than the one in Oakland -- it's still a gorgeous reminder of what movie palaces used to be like. Brian - I've been thinking of doing a post someday about America's movie palaces and historic theaters. The Paramount in Aurora sounds like a fine candidate for such a piece. 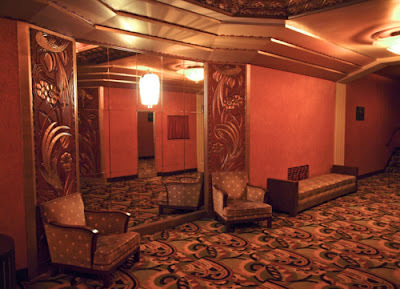 When I consider these fabulous movie houses in terms of the age when they were built, I can't help imagining what it must have been like for Depression era movie-goers. It had to be quite an experience to step out of grim reality and into a luxurious fantasy world - which is what the palaces provided. I am always impressed by theaters like the Paramount. I have been to Radio City several times, but that was years ago. NYC is too expensive now! We are lucky to have some old theaters in SE Pennsylvania, but nothing like this. Thanks for the look, Eve. We will be seeing Casablanca on the big screen for the TCM 70th anniversary showing on March 21, but that is at Regal Cinema! So, enjoy Vertigo (again!) and try to get to Casablanca also! Allen - I wish "Casablanca" was screening at the Castro, but it will be shown at Westfield Centre, a place unknown to me in SF's SOMA neighborhood. In any case, I may not be able to make it due to other plans and I did have the chance to see "Casablanca" last summer at the symphony with the SF Symphony providing the score. Magical. Enjoy! Have a nice time in that beautiful theater. Just think of all that work you did in January to prepare yourself for a big-screen viewing of Vertigo. Thanks, Kim. You make a an excellent point...and I wish all who contributed to and followed "A Month of Vertigo" could meet at the Paramount and experience "Vertigo" on the big screen together. A gorgeous looking theater Eve! I have been to Radio City Music Hall only about three for four times in my life, though I lived in NYC for more 40 years. Remember seeing "Barefoot in the Park," "Come September," and "Bye Bye Birdie" there. I am sure my parents must have taken me there for the Christmas show, when I was a kid, at least once. Back then that was almost a must see during the holiday season. "The Tampa is a superior example of the “atmospheric” style of theatre design. Inside the Tampa, audiences are transported to a lavish, romantic Mediterranean courtyard replete with old world statuary, flowers, and gargoyles. Over it all is a nighttime sky with twinkling stars and floating clouds." They still have regular film showings focusing on current independent, foreign and art films along with a similar type classic film series, as the Paramount has, two or three times a year. Always enjoy going there. Hope you had a great time last night! Spectacular and what a great insight that the Depression era audiences didn't have to wait for the film to roll to be lifted from their misery! 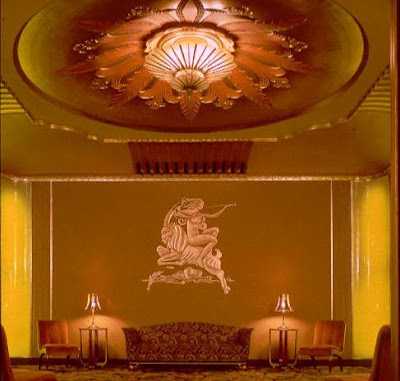 My father was the night manager for the RKO Keith (sadly, now torn down) in Washington DC, so I have specially fond thoughts about these marvelous movie houses. I'll be thinking of your informative blog posts as I view VERTIGO in LA at the TCM Film Fest...so glad you launched that series, Lady Eve! Thanks so much! I envy you, John and Dorian, for your Radio City Music Hall memories - I've never been there, but maybe next time I'm in NYC. I mentioned in a reply to Brian that I'm thinking about a hosting a series on movie palaces and historic theaters, and both the Tampa and the Roxy in Northampton sound like like interesting subjects (not to mention Radio City). Kay - You must've spent a lot of time at the RKO Keith. Had my dad managed a movie house, I would have all but lived there. The TCM Festival screening of "Vertigo" should be especially special with Kim Novak's appearance. Have a wonderful time! Eve, a thoroughly fascinating look at a sadly all too rare entity these days: a restored and operational art deco theater. The prospect of watching “Vertigo” on the widescreen is exciting, after seeing the film through your excellent tribute. Seeing the film is these exquisitely sumptuous surroundings can only be an added treat. I hope you enjoy your evening and will consider doing a series on these art deco movie palaces. Eve. Vista Vision on a big screen, boy are you in for a treat,and with the DTS version having the Herman score in true 3 track stereo, mixed to 5.i . Hello 'Gypsy - Thanks for your good wishes - and - I'm becoming more committed to host a series or event on the historic movie houses that still exist in the U.S. as I read the comments here. Paul - Thanks for the reminder of the technical perfection I have to look forward to! Gasp.. What a beautiful theater. I think I would have a very hard time watching the film and looking around at such a beautiful theater. Thank you for sharing your wonderful evening with us. Magnificent. My thought is, how could anyone walk in to such a place in sweatpants and T-shirts? You almost need to live up to the architecture. Dawn - I'd advise anyone who hasn't been to the Paramount before to arrive early and take a look around before the movie begins. Jacqueline - You make a good point. I didn't mind, though, that much of the crowd was casually dressed, I was just happy that a huge audience (of every age) had come to see a great film - many for the first time (evidenced by the wave of gasps that followed the final scene). Wow indeed - great photos of a beautiful theater. Palaces like that just make the world of make believe more magical. The magic of movie-going is virtually dead. We are so lucky to have the few that remain. Like everybody else, I am awe-struck at the beauty of that theatre. Oh, how I would love to go and see a movie like Vertigo in such an atmosphere! Lovely post, Eve! FlickChick - Movie palaces like the Oakland Paramount surely do add to the magic of the movie-going experience. I am simply astounded by the level of artistry that went into creating such a masterpiece. Becky - 'Twas a wondrous evening and I should add that it was also the serendipitous "cherry on top" of "A Month of VERTIGO."